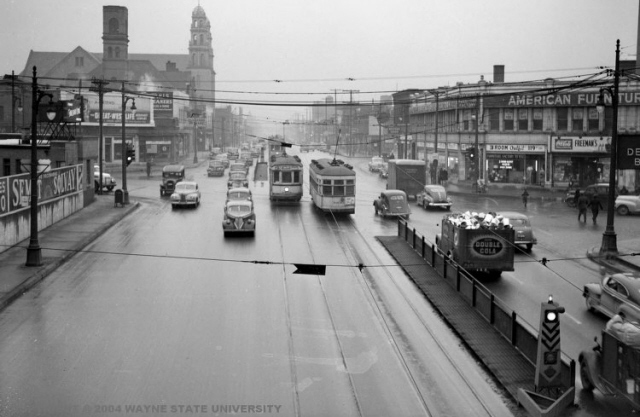 Over the years, the traffic pattern flow along Grand River Avenue would change. As new expressways were built, traffic congestion along a number of the major thoroughfares would ease somewhat. By the late-fifties, the two reversible center lane concept would give way to another Detroit traffic creation — the "center left-turn-only" lane. This unique traffic concept was first initiated along Jefferson Avenue after its PCC streetcars were removed in 1954. Interestingly, for a number of years left turns were forbidden on Grand River during rush hour traffic, while the center "left-turn-only" lane was reserved for through-traffic only — inbound traffic during the morning rush and outbound traffic during the evenings. However, this practice was later abandoned as well, as the traffic along Grand River diminished considerably over the years. Many residents and businessmen along Grand River had even asked that the city have the streetcars and safety islands removed, claiming they disrupted auto traffic in the area. Interestingly, city officials had already been scrambling for years to find ways to increase the flow of traffic along that roadway. This streetcar removal sentiment expressed by the surrounding residents would no doubt give those city officials who favored the removal of the streetcars the added ammunition they would need. 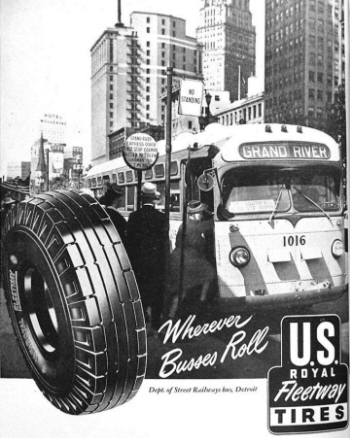 bus in its Fleetway Tires advertisement. by the DSR's Peter Witt streetcars and their accompanying passenger safety islands—both visible in this photo. Meanwhile, the demand for public transportation along Grand River Avenue during that time was still high, with close to 100,000 riders utilizing the Grand River service daily. On Oct. 15, 1945, the DSR began offering express bus service along Grand River to supplement the streetcar service. There were three separate express bus routes to downtown operating during the peak hours — starting at Seven Mile Road; at Archdale (Southfield); and at Ardmore (Schoolcraft), while an "off-peak hour" express service began operating days, evenings, and on Saturdays. The off-peak hour express buses operated in local service (boarding only) from Seven Mile to Oakman Blvd. Beginning at Oakman Blvd., all of the Grand River Express buses operated express into downtown — stopping only at W. Grand Blvd. However, in late 1946, city and state officials announced plans to repave the entire stretch of Grand River Avenue. As a result, the city wanted the safety islands removed in order to open an additional traffic lane in each direction. Of course, the removal of these safety islands would obviously require the removal of the streetcars and replacing them with motor buses. This would prompt the Mayor's office to push for the remaining tracks along Grand River to be covered in order for the city to begin implementing a proposed "reversible lanes" traffic plan. To help accommodate the increased rush-hour traffic, the "two" center lanes would be made reversible — carrying traffic downtown in the morning and back in the evening. The two remaining lanes were used for opposite direction traffic. center lane operation—with four southbound lanes and two northbound—were still being used along Grand River. 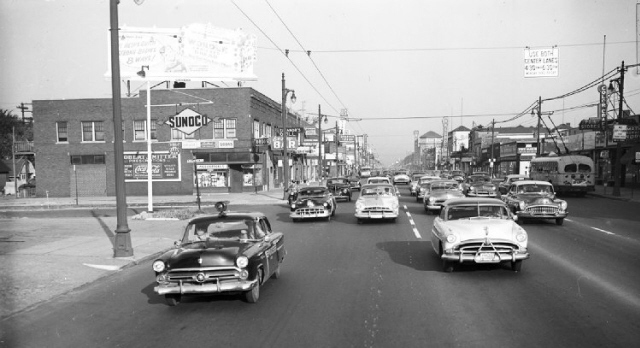 photo, and those reversible center lanes, are all a part of Detroit's rich history, long gone bye. the recorded minutes of various sessions of the Detroit Common Council as recorded in the "Journal of the Common Council — City of Detroit – 1947." Meanwhile, Lloyd B. Reid, the City Traffic Engineer, was quoted as saying: "Rubber-Tired Transit with reversible center lanes fits our Grand River problem like a glove. It has stepped-up traffic from 2500 to 3500 vehicles per hour past out testing point — besides reducing driving time by 5 minutes between Schoolcraft and downtown Detroit (10 miles)." Needless to say, with the safety islands removed and the rails now paved over, the streetcars along Grand River Avenue would never return. The closing of Grand River to streetcar traffic would also have an affect on the Hamilton streetcar line, which also used Grand River into and out of downtown. Consequently, the Hamilton line was converted over to buses one week prior, on April 28, 1947. With a major streetcar line like Grand River now being substituted by motor buses, the future of street railway service in Detroit looked bleak. Grand River had become the first major streetcar line in the city to be taken-over by buses, giving a major victory to the supporters of the rubber-tired transportation industry. electric powered "trackless" trolley-coaches would take over the main operation of the line in September 1951. ...from "Steel Wheels to Rubber Tires." In 1946, the DSR's Grand River line could easily be ranked as one of Detroit's busiest streetcar lines. With peak hour service requiring approximately 50 of the Peter Witt style streetcars to operate along a 14.1 mile route from downtown to Seven Mile Road, definitely qualified Grand River as a major DSR route. However, Grand River would soon become a political battleground — where the proponents of rubber-tired transportation would soon claim that roadway as one of their major victories. During the years following WW-II, the city of Detroit had a serious problem to contend with — Traffic! With the city's population pushing nearly 1.9 million, and the proposed freeway system only in the developing stages, it wasn't uncommon to find the city's major thoroughfares during morning and evening rush hours jammed-pack with traffic. 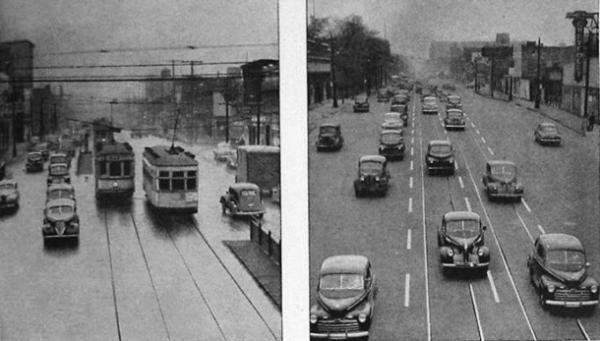 As motorists crawled along those limited number of auto traffic lanes, many Detroiters began accusing the streetcars of monopolizing the center lanes and contributing to the city's traffic problem. 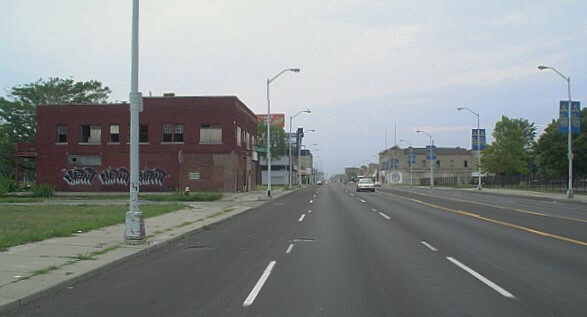 One such thoroughfare where this anti-streetcar sentiment was brewing was Grand River Avenue — a major six-lane highway that extended northwesterly across the city from the downtown business district. Although three lanes carried traffic in each direction, the center lanes were occupied by the streetcars and their accompanying tracks and safety islands. downtown. Within four years city officials would have plans in the works to rid the Grand River line of its streetcars. The planned repaving and conversion of Grand River to rubber-tired transit began lining up factions pro and con on the issue — pitting Mayor Edward J. Jeffries, Jr., the DSR Board of Commissioners, DSR General Manager Richard A. Sullivan, along with area residents and businessmen along Grand River on one side; against the Common Council, the car men's union — Division 26, of the Amalgamated Association of Street, Electric Railway and Motor Coach Employees of America (now ATU), and other pro-rail proponents on the opposing side. The DSR Commissioners, led by President Samuel T. Gilbert, cited the unusual long length of the route required the addition of express buses to supplement the service, resulting in an uneconomical use of street space. The employment of mixed bus and streetcar service on Grand River detracted from the efficient use of the limited available street surface. The commissioners also cited the tendency of auto drivers to utilize the center streetcar lanes — weaving back and forth from the tracks and the inside lane in order to overtake and pass streetcars — contributing to further traffic slowdowns. The elimination of the tracks and safety zones from the middle of the street would provide three full lanes of free flowing traffic along each side of the street. 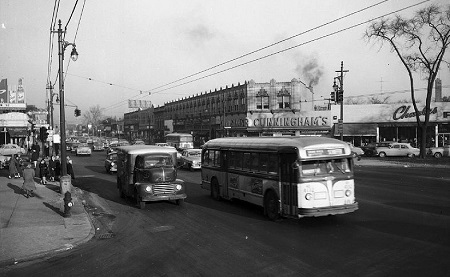 The DSR management, led by general manager Richard Sullivan, wanted the 50 or so streetcars needed for its Grand River operation removed from its Coolidge Terminal in order to begin rebuilding the Coolidge site into an all-bus facility, where the department could store its increasing bus fleet. Obviously, the city's own transit department favored the streetcar removal and bus conversion aspect of the plan. Of course, the streetcar and coach men's union (Division 26), would be looking out for the jobs of its union members and were in opposition, as were the overwhelming majority of the Detroit Common Council members, who heavily supported the retention of streetcars on the city's major lines and fought to maintain that service. Consequently, the council rejected the immediate total conversion plan and implemented a temporary four month trial period of bus substitution, allowing only for the removal of the safety zones from one side of the street during the trial period. The council intended for the DSR to reinstate all rail service on Grand River if the bus substitution proved unsuccessful and didn't live up to expectation. Beginning Monday, May 5, 1947, 98 motor coaches (including local and express) replaced the 50 Peter Witt style streetcars on Grand River. However, on that very same day, and without the council's approval, Mayor Edward J. Jeffries, Jr. would order the city's Department of Public Works to pave over the streetcar rails along Grand River between Trumbull and Joy Road. The Mayor cited the extensive rail and pavement deterioration along that stretch of right-of-way as a reason for his actions. With streetcars no longer operating along Grand River, the two center lanes were now open for vehicular traffic. However, the traffic congestion problem along Grand River would continue to increase. 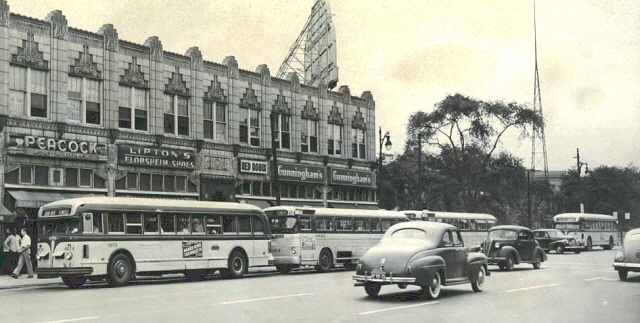 taken during the early 1950s, express bus service had continued on since October of 1945. 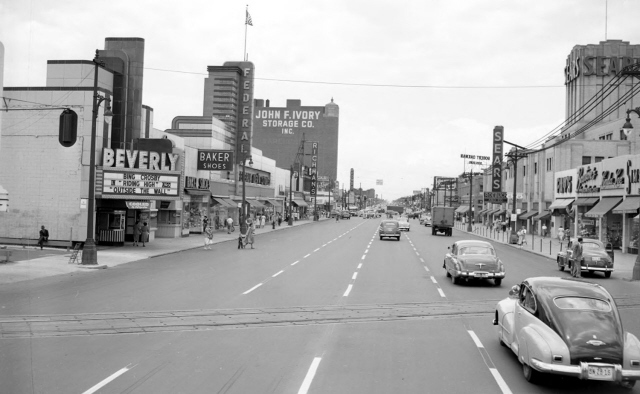 GRAND RIVER AVENUE: COMPARED SIXTY YEARS LATER!